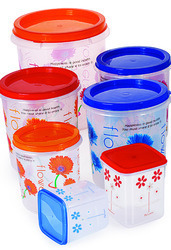 Our containers are manufactured with superior food grade raw material and are available in assorted colours and styles. They are air-tight which is very essential to keep the food inside fresh and free of outside odours. A high drop impact resistance provides safety, durability and long life to our containers. We take utmost care to ensure that our containers are able to withstand high temperatures and hence can safely be used in microwave ovens. 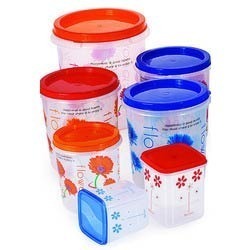 We manufacture multicolor packs that are used to store various items. These are air tight and keep the item moist free for a longer period of time. Our product can be customized as per the needs and requirements of our clients. We present wide range of ever fresh containers that are widely demanded because of their lightweight construction, cost, versatility and high performance. These come in variety of shapes, sizes and styles.